Google has recently redesigned the advanced search page and removed two options that weren't used very often: finding pages that are similar to a page and pages that link to a page. You can use the similar: and link: operators and "similar pages" and still available in the Instant Preview pane, so the features haven't been removed. What's disconcerting is that Google made drop-down lists a lot more difficult to use in the new interface. Until now, you could use the tab key to select a list, but this no longer works. After clicking a list, you could use the up/down arrows or Page Up / Page Down to move between the options, but you can no longer do that. 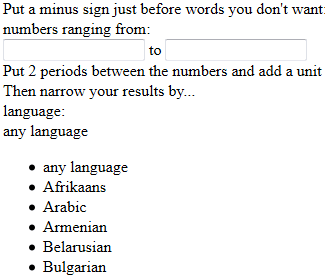 It was much faster to type the first letters from the name of the language or the country to quickly find an item, but this is another feature that no longer works. Basically, the only way to use the new lists is to scroll up or down until you find the item you were looking for. Google's lists are also inaccessible to screen readers, so they can't be used by people who are blind or visually impaired. The explanation is that Google now uses regular lists with custom styles instead of drop-down lists (or drop-down menus). Disable CSS and you can no longer select an item from the list. You can check the old advanced search page at the Wayback Machine or the advanced image search page, which still uses the old interface. 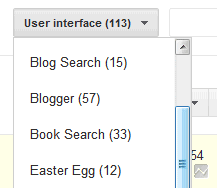 Another service that makes drop-downs more difficult to use is Blogger. If you have a long list of labels, you can no longer find a label by typing the first letters. 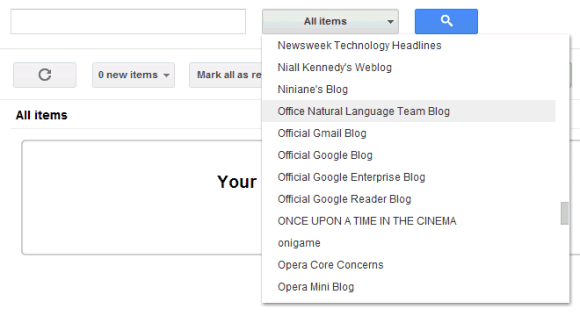 Google Reader's new interface lets you use arrows to move between the items from a list, but you can no longer type some letters from a subscription's name in the "All items" drop-down. 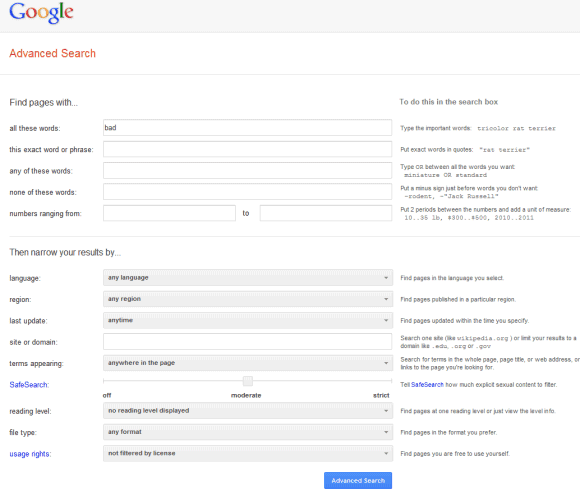 This was a non-standard featured added back in 2007, when Google Reader added a search engine. Hopefully, Google will address these issues and will no longer remove basic features that are taken for granted by many users. The author obviously cannot see past his thick cloud of short-term thinking and doesn't understand that Google is pushing towards a future of unified user experience across multiple platforms. On soon-to-be-huge-screen-smartphones and current tablets, there are no Tab keys, there are no scroll wheels, and there is no right-click. Google is making its web services available to tablet users, all the while solving its visual inconsistency across Windows, Mac and Linux at the same time. It's a win-win for it. Sorry okungnyo, there's no win-win in this. Until the world is composed mainly of smartphone or tablet users, there's no good reasoning behind this change. When you're a company with a user base as huge as Google's, this is just a stupid mistake. Google shouldn't push a keyboard-unfriendly UX when most of their audience are still desktop users. It's a step behind, not forward. I also experienced an issue where a drop down menu was broken in the sense that I couldn't even scroll through it. I believe it was to change the time zone in blogger. Scrolling down would go down 5 lines or so and then jump back up to the top. Try to refrain from personal attacks. Like Wikipedia's policy says: "Comment on content, not on the contributor." The new UI may look nicer and be more consistent, but it's less functional. Google's new drop-downs require a mouse (or a touch interface) and it's a lot more difficult to find "San Marino" or "Poland" in a long list of countries. And it's not just about the desktop. I tried to use the advanced search page on an iPad and it's not easy to scroll, find an item and select it. Google's custom controls are less fluid than Safari's native list control and you have to spend a lot of time* to select an item from the bottom of the list. It's probably faster to type the name of the country than to select it from a list and that defeats the purpose of the list. * 19 seconds to select "San Marino" on an iPad vs 7 seconds in the old interface (I added ?hl=ro to the URL to switch to Romanian and get the old interface). New drop down lists (as i see) are linked to the new look; and new look linked to tablets and cell phones. e.g. in the new gmail look, the [Mail][Contacts][Tasks] selector is now a drop down (3 items) list and oblige you to make two clicks to achieve what in the classic look just need one click. My guess is that in tablets this is more natural and useful, and to the old dinosaurs which still uses PCs with keyboards and mice "que les den por culo"
But I like being a troll. Morons that make moronic posts need to be called out. Also just in case you didn't know... This isn't wikipedia. This is surprising, since Yahoo's HTML-based menus go to great lengths to work properly with the keyboard, as in the examples at http://yuilibrary.com/yui/docs/autocomplete/ac-local.html and http://yuilibrary.com/yui/docs/node-menunav/node-menunav-3-example.html. Surely it's not that hard? There is a very similar problem in the new Gmail look with regards to creating new filters. Previously, users were able to select which label they'd like to apply to the filter's incoming conversations. They could create a new label or select an existing label. Users were able to start typing the name of the label to get to it. Not anymore. @Robert Dailey, Alex knows this isn't Wikipedia. This is Alex's blog. We are his guests and therefore we play by his rules. I also experienced an issue with Gmail new version! Had Google temporarily taken off the new design? I don't see the new interface either. Maybe you're right. Bedava film izle me sitesi. Canlı filmizleyiver de şahane ortam. Online hd film izle de son nokta. Sınırsız müzik dinle ve indir. Bedava mp3 indir .